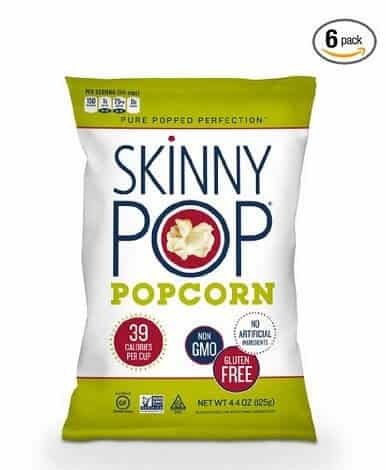 SkinnyPop Popcorn, original flavor contains only three ingredients: popcorn, sunflower oil and salt. These simple ingredients form a perfect snack that is fairly low in calories (39 calories per cup, 150 calories per 3.75 serving). Each serving contains 3 grams of fiber (12% of the recommended daily value) making SkinnyPop a more health-conscious alternative to many other chips and snack which often contain a variety of artificial ingredients and no fiber. A 3.75 cup (28-gram weight) serving also only contains 75 mg of sodium which is less than half of what you will find in many potato chip servings of the same weight. This makes the product better for anyone who is salt sensitive or has blood pressure issues related to sodium. Additionally, SkinnyPop is non-GMO verified gluten-free and kosher making it perfect for many diets. SkinnyPop is also vegan/vegetarian and contains heart-healthy whole grains. It is also free of trans fats and made with the least amount of ingredients possible to create one of the most wholesome, ready-made snacks available. Although SkinnyPop is non-GMO it does not qualify as being organic. While the ingredients are few and considered “all natural” they are not produced or handled in a way that would allow them to be classified as organic. SkinnyPop is manufactured in an allergen free production facility. Peanut free, tree nut free, soy free and dairy free. The original flavor which is flavored only by the natural taste of corn and a light sprinkling of salt provides a satisfying crunch that is lower in sodium and higher in fiber than potato chips. The sunflower oil that the corn is popped in provides just enough fat to keep the popcorn from being completely dry like air popped varieties can be. That being said, some reviewers were underwhelmed by the taste and texture stating that the product was “Nearly flavorless and dry as trying to eat cotton balls.” If you are used to pouring butter or butter flavoring onto popcorn then SkinnyPop might seem dry in comparison but for many, this does have the right amount of fat and salt to be tasty without being particularly decadent. However, the reviews are overwhelmingly positive with over 800 reviewers rating SkinnyPop Original with a perfect 5-star rating. These are particularly good for taking to work or school where the temptation to snack out of stress can break many diets.